Dee Oreiro has documented one of the first rides in the Tucker 1044 at its new home in Roslyn, New York. wow what a car ,i wish i could buy one if it was available,but probably could not afford it! Nice video - should get one from inside the car. Back in 1949, I had persuaded my father that he needed to buy a “bathtub” Nash. He actually went along with it and on a warm spring day we were doing a deal at Babe Reising’s Nash dealership on Reading Rd. in Cincinnati. Across the road I saw a Tucker sign on a showroom and zipped over there. 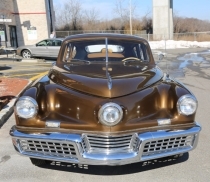 Sure enough, there was a new Tucker in the showroom, in that Root Beer Brown color. Though the showroom was wide open, there was nobody around, no literature or anything but a few bare desks and chairs. Being fifteen, I didn’t hang around and had no camera so the incident is “memory only.” I often wonder where that Tucker ended up. Thanks for posting and good luck with the Tucker. Look forward to more videos e.g. how it would perform on say the Northern or Ocean parkways on some early Spring Saturday mprning. How many people can say I cruise in a Tucker! Enjoy, Howard! I can say I cruised in that Tucker. My father David Tunick owned the car. Enjoy it. My father would be happy you’re driving it. Stephen, I believe your father owned Tucker ‘48 #1044 from 1969 to 1973. I’m glad you got my message. The car was Orange ! I will have to look through thousands of pictures to find - but I will. If I find one or some, I will most definitely forward them to you.